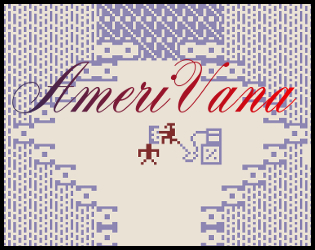 Amerivana is my first game. Inspired by the works of Jack Kerouac and the films of David Lynch, Amerivana takes place on a mysterious ghost train gliding through the wheat fields of some kind of world. You'll find some interesting characters along the way, each with their own interesting thoughts and non sequiturs. This game was made with Bitsy, a pixel-based game engine created by Adam LeDoux.